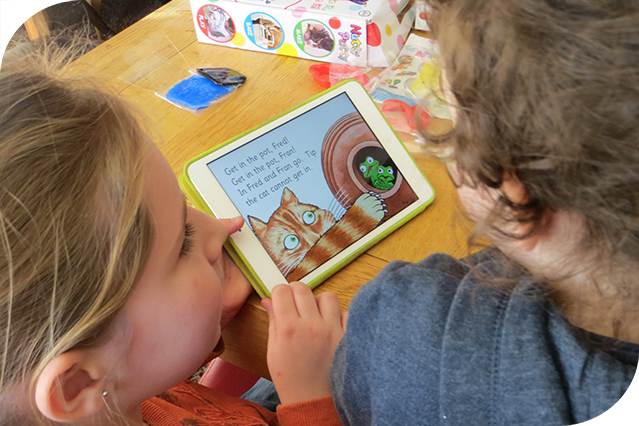 Last month some children and their parents had a look at the first of our e-reading books, Hop! Hop! Hop!, which will be available from Amazon later this week. They loved it! At each level of the phonics game app there is an e-reading book which uses the sort of words that are used in the game. This ensures that children are able to work out the words they come across when reading the book, and therefore use their emerging phonic skills to ‘read for real’. This is a big thing for any child, and parent. The Department for Education recommends that parents use decodable readers of this sort with their children, so that they can “work out new words from their letters and sounds, rather than just guessing”. The National Curriculum Year 1 programme of study requires that pupils read “books that are consistent with their developing phonic knowledge and that do not require them to use other strategies to work out words”. The children and parents who previewed Hop! Hop! Hop! loved the frog characters and really enjoyed the story. You can read it soon, too. It will be available from Amazon, priced £1.99 including VAT, in a matter of days. Watch this space!